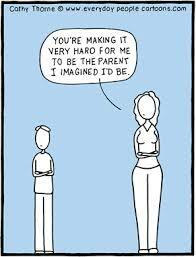 Sometimes I imagine casting off the shackles of ‘therapeutic parenting’. My ‘no’ being a ‘no’ and my ‘yes’ a ‘yes’. No dancing with words around delicate issues. No fear, anxiety and pain wrapped up in angry words and actions to tidy up. No pre-emptive discussions with school, coaches, family, doctors, SWs and friends. No pre event and post event debriefs. No protracted and unending negotiations. No knot in my stomach when I know I have to take a stand over some minor issue that is pretty major. No wishy washy compromises that leave me feeling that I’ve let down all parents everywhere. Not sticking endlessly to the ‘tried and tested’ places, foods, people and events. I’m pretty sure that the kids feel the same. On the upside the Sky man came and we've now got telly, or as I like to think of it 'daddy's little helper'. Love this! Could not agree more. I dream the same dream. Some days it seems like a far off land! Totally agree with this. They're nice fantasies and involve an easy life with dinner at a normal time in the evening. It's the little things that I often miss.